I am not a medical professional, nor a doctor. I do seek scientific confirmation of the safety and effectiveness of the herbs and remedies I use but No information on my website is intended to be medical diagnoses or advice and should not be interpreted as a substitute for diagnosis and treatment by a health care professional. If you have any symptoms of serious illness, are taking medication, are pregnant or nursing, or have never worked with herbal materials before, you should consult a medical professional before use. I am unable to offer advice for your particular medical situation; please ask your doctor, nurse practitioner, naturopath or other qualified licensed professional for further guidance. I've recently begun using Affiliate links on my blog, these links shouldn't affect you as a reader, all they mean is that if you follow the link and then, subsequently, make a purchase I will receive a % of the sale, this is at no extra cost to you but it does help us with the renovation and repair works on the cottage and my endless need for chocolate therapy. However, I only support and promote products and companies I personally have used and love. I truly appreciate your support. Thank you so much. 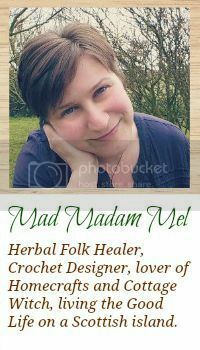 Mad Madam Mel is a for profit blog and I am a member of affiliate programs. Thank you so much for supporting me and my blog. Last updated 29th March, 2014.